I'll have to take a pic of it and post it Garet. 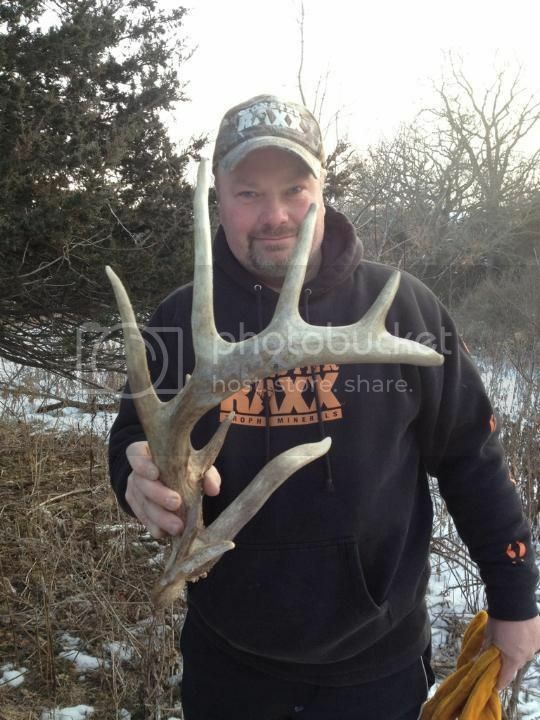 The largest shed I found last year was 73 6/8"
As far as an antler trap, use a down tree or brush pile. I have never been an advocate of wire pulling the antlers off. I have found several in brush piles where I have dumped corn or placed a cornsickle. That matched set I found last year was in that same ballpark. Hopefully we can find them again this year. Here is my largest shed from a buck I called Split Brow. It is exactly 98"
never had any man made trap work for me either. You definitely win! That's one helluva shed. The 4 biggest r pictured together. 7 total. holy crap! nice finds! I better get looking! That is awesome. I was thinking about looking Saturday but it is supposed to rain. Awesome, way to get us going! It looks like everyone has checked in but alec. Which one of you guys wants to be the Captain? I'm horrible at creativity so I usually Google something to come up with a team name. Any ideas? I glanced today when I swapped cards in the camera but didn't see anything. I haven't had any pic's of ones that have started losing yet either. I'll do the captain thing you guys do the name thing. I'm good with whatever.